TRUTH: I have only ONCE hired a babysitter that was not my mom or siblings in my four years as a mom. WHY? Because I am terrified of the “what ifs”. My two little monkeys are my entire life, my entire heart. When it comes to making decisions for them, it is my responsibility as their mother to learn the facts, weigh the risks and benefits and make a solid and educated decision for what is best for them. They can’t yet do it for themselves. As a nurse, it is my honor and my privilege to be able to provide facts and evidence for you to help you make important decisions for your baby. After delivery, completing that sweet skin to skin golden hour, and learning how to nurse your baby, the baby care team will then perform an assessment on your newborn, administer a Vitamin K injection, a hepatitis vaccine, and erythromycin eye ointment. While each one of those things is important and highly recommended by the American Academy of Pediatrics, the Vitamin K injection is probably most important to have administered at birth. Vitamin K is a… well, it's a vitamin, and a very important one at that! It is crucial for activating certain molecules, called clotting factors, that are responsible for blood clotting. We don’t make it ourselves. We get almost all our Vitamin K through leafy green vegetables and a small amount of another type of Vitamin K (called Vitamin K2) through the bacteria that lives in our intestines. If we do not have enough vitamin K, we cannot activate the clotting factors when necessary, resulting in inability to stop bleeding. While the baby gets everything they need from the mother during pregnancy, a very small amount of vitamin K transfers to the baby through the placenta, and after the baby is born, there is not enough bacteria in his/her intestines to make the other form of vitamin K. So basically, their levels are critically low. Since babies have a critically low level of Vitamin K, they are high risk for suddenly bleeding anytime from the first 24 hours of life to 3-8 weeks post delivery. If your delivery included forceps or a vacuum, than the risk for a bleed is super high. The most common time is 2-7 days after birth when the levels of Vitamin K are the lowest. Bleeding that occurs from Vitamin K deficiency in babies usually occurs in their brain, gastrointestinal system, umbilical cord site, skin, nose, and circumcision site and can be deadly if not treated right away. What is the treatment for Vitamin K Deficiency Bleeding? The Vitamin K Injection. While that may not seem like many, that does mean there STILL are babies that suffer from this. And, according to the CDC, one out of every five babies with VKDB dies. Please know, I am not trying to scare you by providing this information, I just want you to be aware of the seriousness and the reality of it. Okay, Jessica are there any other ways to give my baby(ies) Vitamin K without the shot? What about breastmilk? That has, like, everything!! GAHH, unfortunately Vitamin K is probably the only thing that breastmilk does not contain enough of. Most of the cases of severe vitamin deficiency bleeding have occurred to babies who have not been given the Vitamin K injection and are exclusively breastfeeding. On the other hand, formula is has a very high concentration of Vitamin K.
The best way to make sure your baby is protected against bleeding is through the Vitamin K injection. The Vitamin K injection is a very concentrated injection to your baby’s thigh, that will slowly release enough Vitamin K to protect your baby throughout the first few MONTHS of life. *** UPDATE: While Oral Vitamin K has been shown to be effective in certain regimens, there NOT currently an oral form of vitamin K in the United States for newborn/infant use. Actually the availability of oral Vitamin K, is diminishing in other countries as well. Possibly because the injection route is a definite, one-time, preventative, and fool-proof method of protecting babies from Vitamin K deficiency bleeding. While you may find oral vitamin K on the internet, you should be aware that they are not regulated, meaning there is no third party testing these products to make sure they contain the proper dosage, that they contain exactly what they need to and exactly what they say they do, and that they are safe for newborn/infant consumption. 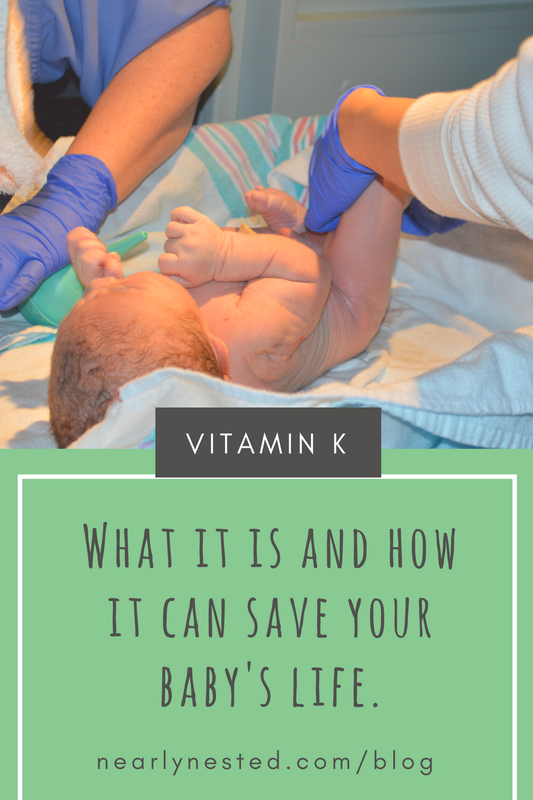 Check out Evidence Based Birth's information on oral Vitamin K.
While the thought of injections to your sweet delicate baby can be heart wrenching, remember that the injection itself is fast and can save your baby’s life. In fact, the anticipation of the entire experience is harder on us parents than it is for our babies. One of the best ways to comfort your baby during injections, heel pricks, or actually anytime they are fussing is to hold your baby, bring him/her to your chest for skin to skin, breastfeed, or allow sucking on a pacifier or clean finger... and then take a deep breath. Parenting isn’t always easy, but I can promise it is worth every ounce of worry. You’ve got this! From one parent to another, Happy Nesting! Perinatal Education dedicated to help empower and prepare new mommies and daddies for the sweetest journey as parents.